The fact that European lifestyles are not sustainable in the long term is hardly a surprise for anyone. However, there has been a total gap in through research into what kind of social structures and lifestyles can be disruptively more sustainable. In this scenario-report we present extensive and in-depth research on sustainable lifestyles into year 2050. The scenario’s are based on the two significant uncertainties. Future technology is either “pandemic” or “endemic”. Additionally future society’s governing principle is either humancentric or meritocratic. 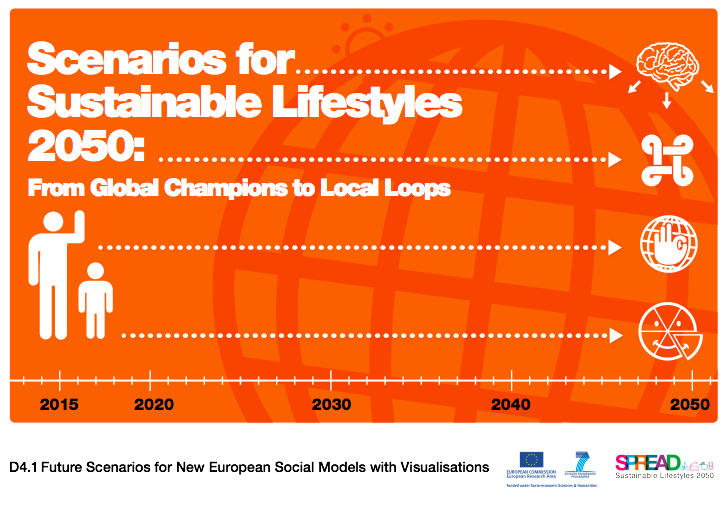 From these different viewpoints we have created four alternative scenarios for lifestyles in 2050. The scenarios are Singular Super Champions, Governing the Commons, Local Loops and Empathetic Communities. Authors: Juha Leppänen, Aleksi Neuvonen, Maria Ritola, Inka Ahola, Sini Hirvonen, Mika Hyötyläinen, Tuuli Kaskinen, Tommi Kauppinen, Outi Kuittinen, Kaisa Kärki, Michael Lettenmeier, Roope Mokka.